Example of Vandalism in Suva. Neil Cook is the CEO of the Fiji Roads Authority. This is his regular column which will be published by the Fiji Sun on Saturdays. We hear people are asking, “…why do we have to drive at 80km/h if you can easily drive at over 100km/h?”. This surely does indicate that the level of driver confidence on our roads has increased much like their need for speed. There is good reason why the speed limit on our open roads is still at 80km/h and 50km/h near urban dwellings, towns, cities, villages and communities. We can see that our roads are improving and we can also see that there is more work still to be done in areas we haven’t reached yet. While the road surfaces are improving, we still see how fragile the roads are after heavy rains. The good news is of course that it takes us much less time to get the roads back in order now than it did a few years ago. We are winning the war against deteriorated road conditions. 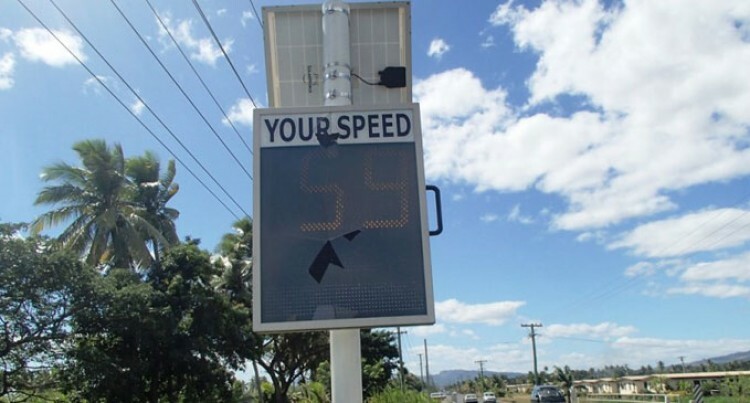 There is another reason the national maximum speed limit of 80km/h remains appropriate for Fiji’s roads. This is because while the pavement and surfacing has been improved significantly, our associated safety improvements are very much a work in progress. Signage, guardrails, curve warnings, road markings, better provision for pedestrians, better control of livestock – all these things are needed to contribute to an overall driving environment. These may, in the future, allow for increased speed limits on some sections of road. International research tells us that there would potentially be more than 50 per cent increase in fatal and serious injuries if the speed limit is raised to 100km/h before the road safety measures are in place to the right level. Along with widespread ‘general safety improvements’, Fiji Roads Authority undertakes systematic analysis of crash statistics to identify ‘black spots’. These are those sections of road that for one reason or another stick out as having a history of accidents. We then assess these black spots to determine the best solution to address the problem. One such project just completed is the construction of traffic islands at the Raiwasa and Ratu Mara Intersection in Samabula to remove the ability to turn right across the flow of traffic. We have been concerned for quite some time over the safety at this intersection. It features as a “Black Spot” in terms of accident history and has been subject to a temporary 30km/h speed limit for some time – an initiative that is largely ignored! Traffic turning right into Raiwasa St from Ratu Mara Rd was at risk of being hit from behind and had to then cross two lanes of traffic. While traffic turning right from Raiwasa Rd into Ratu Mara Rd had to cross two lanes of traffic and then find room to merge into the traffic stream. Small changes like this are taking place all over Fiji and they do contribute to a huge difference in terms of road safety. It is vital that this investment in road safety projects continues otherwise the increasing speeds we are seeing as a result of improved road surfaces could potentially reverse the positive downward trend in fatalities over the past decade or so. And this is why it is so disappointing to see deliberate destruction of assets that are installed to keep motorists and pedestrians safe. Vandalism is on the rise and quite sad really that some individuals do not appreciate the use of information signs. They guide and advise motorists on the road. This week alone, we have received numerous complaints of road signs being vandalised and damaged by individuals. An unharmful prank it may seem to some could be costly to others. It becomes silly if we have to allocate a budget towards enforcement on road signs to deter these culprits. The Bike Show on Sunday at Damodar City in Suva was a great opportunity to acknowledge Fiji’s ardent motorbike loving community. In addition, we can recognise the potential shift in what could become a preferred mode of transport for Fiji. It is quite common in many countries abroad to commute on two wheels and the event on Sunday recognised this and touched on the importance of the safety of our bike riders on our roads. They too have a right to drive over our roads just like buses, cars and trucks. Views may differ on what the perfect road should look like and as I noted above we are still in recovery mode and will be for a little while yet. That said, every year, every month in fact, there is improvement to more and more sections of our road network. In the Central Division for instance, in addition to Lakha Singh Road in Tamavua, Charlton Avenue, Gardiner Road, and Crawford Street in Nasese are also being rebuilt. One of the greatest highlights of the past few months has been the road rebuilding work taking place on Ovalau. The sealing work currently underway is taking place through the village frontages as well as in front of the residential areas and is just about finished for this year. I can only urge motorists to keep in mind that a pedestrian is 10 times more likely to die if you hit them at 80km/h than if you are travelling at 30km/h. This likelihood goes up if they are very old or very young. Please slow down through our villages, keep yourself and everyone else safe.